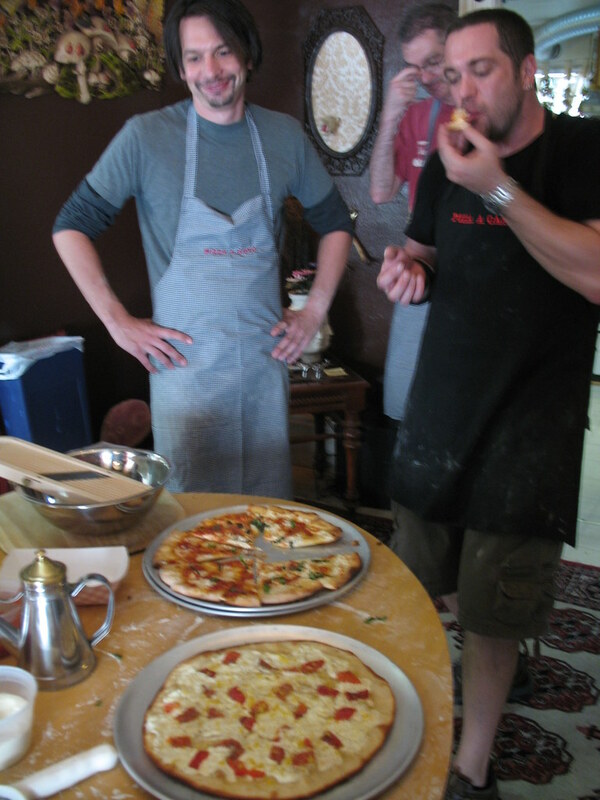 Pizza a Casa is Mark’s artisanal pizza workshop and catering company. Partly taught on the streets of New York, partly in his casa, the five-hour class I took on Sunday was its house special signature. Though he’s cooked professionally elsewhere, Mark stays true to his homemade pizza-making roots; living in Chicago, he often turned his apartment into a “pizza-making lab” with friends late at night, after the bars. The reason being, “It was either go to a greasy spoon diner, or make pizzas at my place.” Wisely, more and more friends chose the latter, and after moving back to the Northeast, Mark now frequently turns his downtown apartment into just that for small groups of strangers, with an immediate and genuine friendliness. Another pie I tried my hand at also undersold itself with its name: the “White Pizza” had home-roasted red peppers and refreshing ricotta cut with chunks of butter and fresh mozzarella. It’s sprinkled with lemon zest and black pepper once out of the oven, and by then its cheeses are congealed to a moist and delicate-tasting mass of white. Mark is also just as particular about his ingredients as he is about making the pies. He buys cheeses from Saxelby Cheesemongers, in addition to his favorite independent Italian cheese shops, and the ricotta I’d been blessed with was Salvatore Brooklyn’s. Of course, we made the classic marguerite to start off the workshop. Growing up in northeast New Jersey (incidentally in the town right next to the one I did — yeah, his high school’s sports teams stank), Mark visited New York City with his family often. They’d scavenge Little Italy for their favorite homemade mozzarella, fill up on roast duck in Chinatown, and take choice cuts back home on the train. 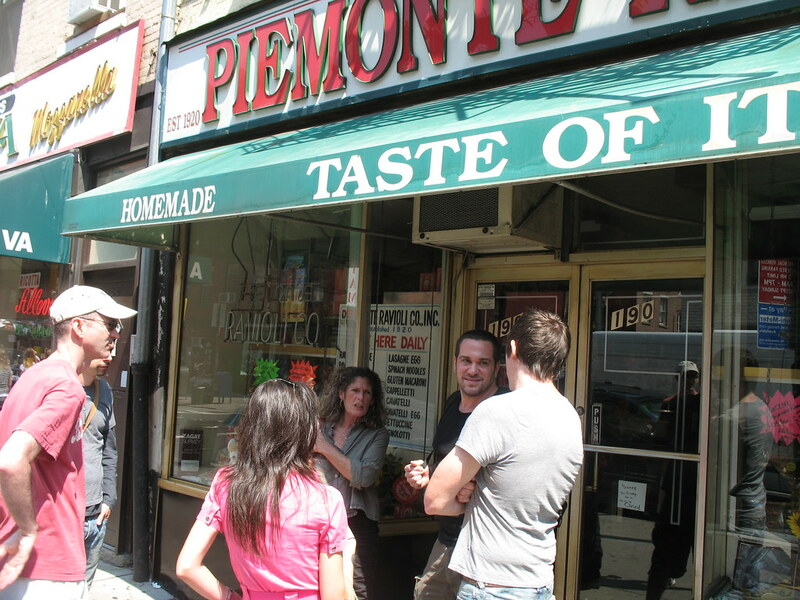 So, for the first hour of his pizza classes, Mark takes his students to some of his favorite shops, which he’s become a regular at. 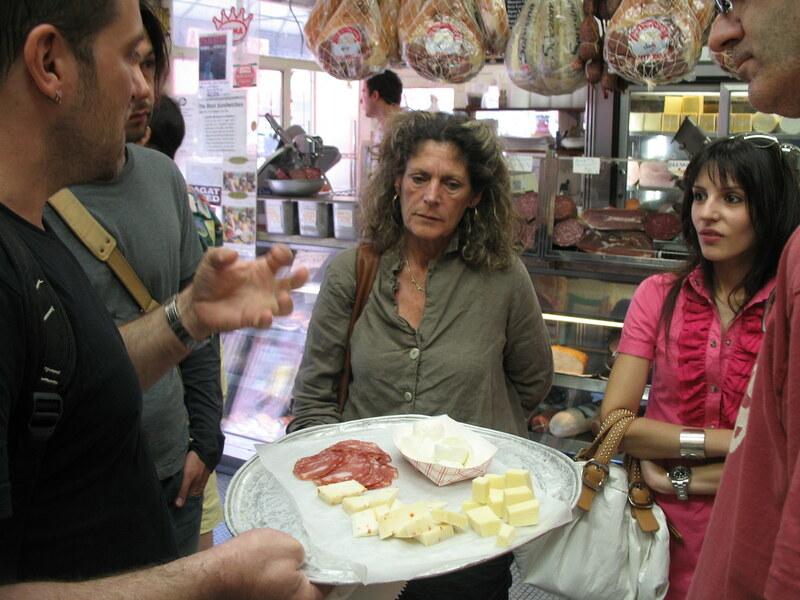 The first stop was Alleva Dairy, the family-owned Italian cheese shop for five generations. 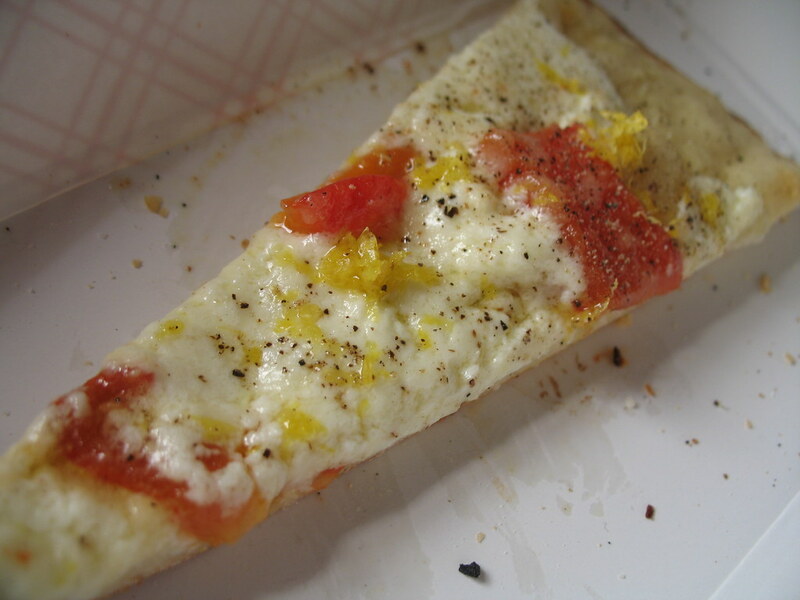 Their mozzarella is made fresh every day, and Mark’s been a lifelong fan. While at Alleva, Mark pointed out one of his secrets. The tomato sauce we’d be using was not something to spend time on simmering, but a jar of San Marzano tomato passata. According to Mark, it’s just salty enough, non-acidic, and gently flavored with basil to serve as the pizza sauce, with a grate of fresh garlic. Easy enough for me! We also stepped into DiPalo a few doors down, another relic of Little Italy that’s been in business for nearly a century. I don’t want to give away too many of the chef’s secrets, nor would I be able to in one post. The dough-rolling wisdom I’d gained would be enough to go on about alone. We turned out wheel after wheel of perfectly thin crusts over the next couple hours of the class, though “perfect” is not exactly the right word. There’s an Italian cooking concept called capricioso (“capriciousness”) that Mark pays respect to, which favors homemade touches over uniformity — one bite is a little crispy, another is chewy. This is the ideal texture of pizza dough, and Mark has mastered it from years of experience. 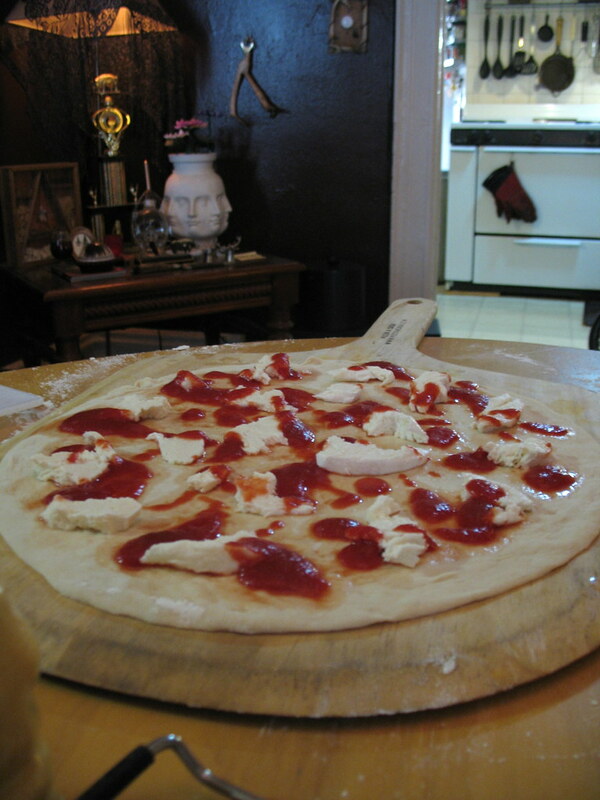 When asked why none of the recipes on the list had a whole wheat crust, Mark explained that it was just a flavor preference; he didn’t think whole wheat went well with tomato sauce and cheese. But, it could pair nicely with other toppings like, say, caramelized onions or fruit. If you take a class, you’ll also take home an extensive packet of recipes, useful resources and tips, all written in Mark’s witty tone. 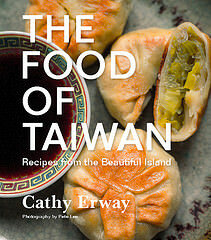 I am happy to spill how easy it was to produce a runny-yolked pie, however. To start, the pancetta was placed evenly atop the dough in little clumps to act as “breakers” for the eggs. I made the mistake of adding sauce just afterwards, which had not been part of Mark’s original vision (because it interferes with the pancetta crisping up), but only a little bit. Before baking, a shower of grated aged pecorino went onto nearly every pie variety, to provide saltiness, and this one got it, too. Then it was into the oven to cook about a third of the way. The eggs are cracked into bowls and gently slid on top of the pie at that point; a few minutes later, it was done. After the five hours were through, I’d made four pizzas and eaten enough slices to put me out. I still had to bike home, though, in the ninety-degree heat (we could have baked pizzas on the sidewalk it was that bad). Because they were so good, I decided that I was going to somehow bring all my leftover pizza with me, across the bridge. I have no idea where I thought I was going to put the boxes — on my head? Fortunately, as I was grappling with this scenario on the street, I ran into an old friend who was on his way to a park, and thrust the pies upon him instead. He gladly accepted, and wrote later to say how yummy they were. “I’m sure anything made by you is good,” he’d said. My compliments, of course, to the real chef. Sign up for Mark’s pizza workshops and tours, or catch one of his classes at WholeFoods, Astor Wine Center, and elsewhere at Pizza a Casa’s website. Combine the yeast with the warm water and stir to break up lumps. Let sit for 5-10 minutes or until yeast starts to become foamy and separate. Combine the flour, salt and oil. Fold in the proofed yeast mixture until the dough just comes together and turn it onto a well-floured surface. Knead for at least five minutes. Divide dough into 4 even-sized balls and pinch any folds shut for a seamless surface. Let sit at room temperature in a tighly sealed container to rise for 45 minutes. Preheat the oven with the pizza stone inside at 500-550 degrees (as high as it will go). Place dough onto a well-floured surface. Press around the edges until you have a roughly 5″ round. Pick up and carefully stretch out the dough with your hands until it’s roughly 12 to 14″ in diameter. 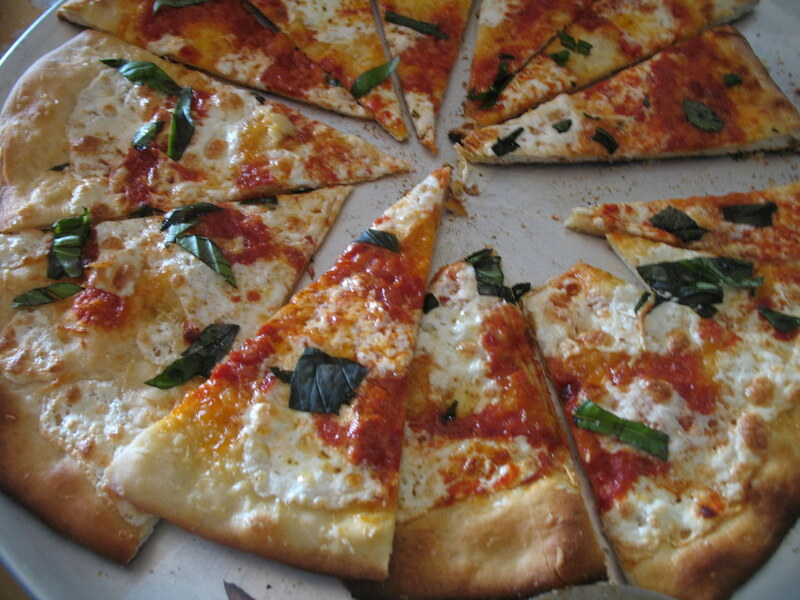 Dust surface of pizza peel with optional semolina flour and carefully place the dough round on top. Arrange the pancetta pieces evenly throughout the pizza. Sprinkle the grated pecorino on top all the way to the edges of the crust. Quickly open the oven to slide pizza onto the stone and shut (to retain heat). Meanwhile, heat the olive oil in a small saucepan until it begins to crackle. Add the sage leaves and cook about one minute, turning once. Remove from oil and let cool on paper towels. Crack the eggs into three separate bowls. Once pizza has been in the oven for about four minutes, quickly open the door, slide the rack out, and pour the eggs on top of the pizza one at a time. Carefully push the rack back in and close door as quickly as possible. After 2-3 more minutes, check on the pizza. If the whites are all cooked through, remove pie from oven with the peel and slide onto a tray. 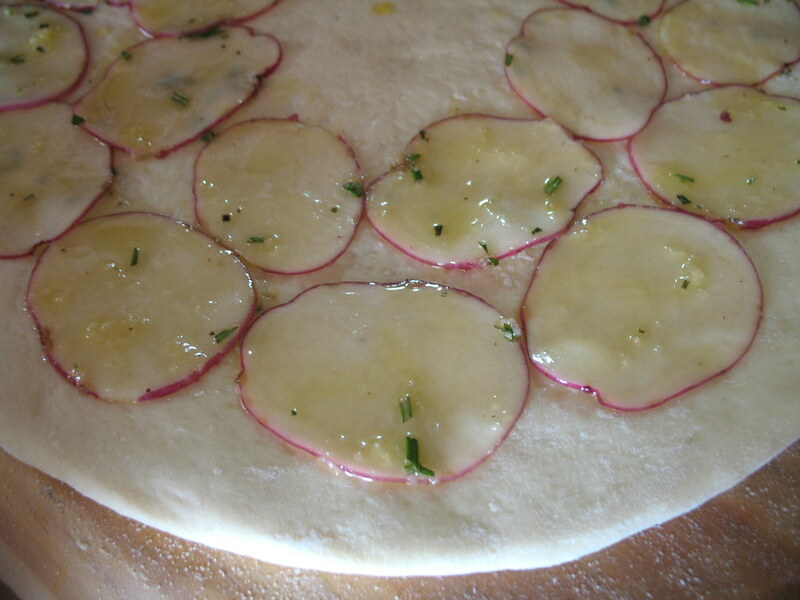 Top the pizza with the sage leaves, a drizzle of olive oil, and an optional grate of black pepper. Scott’s pizza tours is so much better! All of my friends cringe when I try to offer them homemade pizza with an egg cracked on top… their loss. 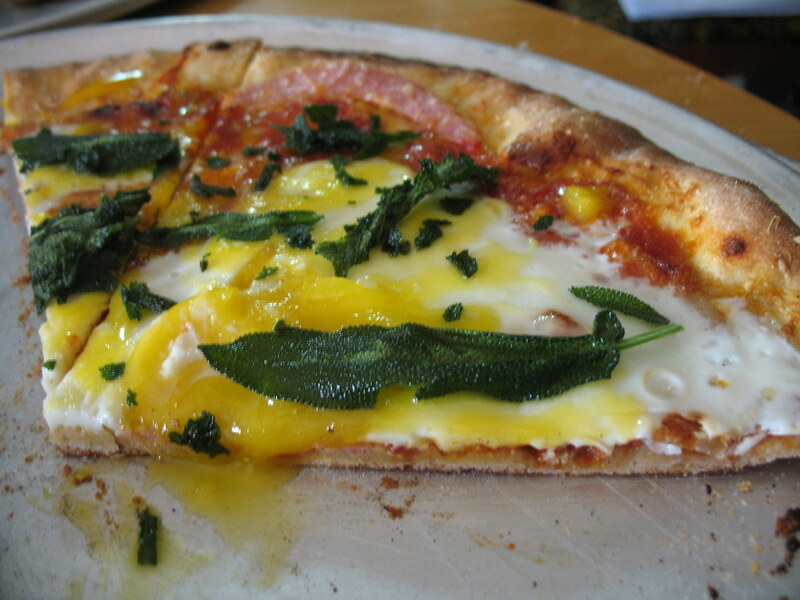 In agreement with Jeff above–every time I try to talk up the sublime ecstasy that is runny egg yolk on pizza (I mean come on, it’s like nature’s gravy), my friends cringe. I don’t get it. That pizza looks like heaven. Runny eggs atop anything are brilliant, but I’m equally excited/intrigued by FRIED SAGE! 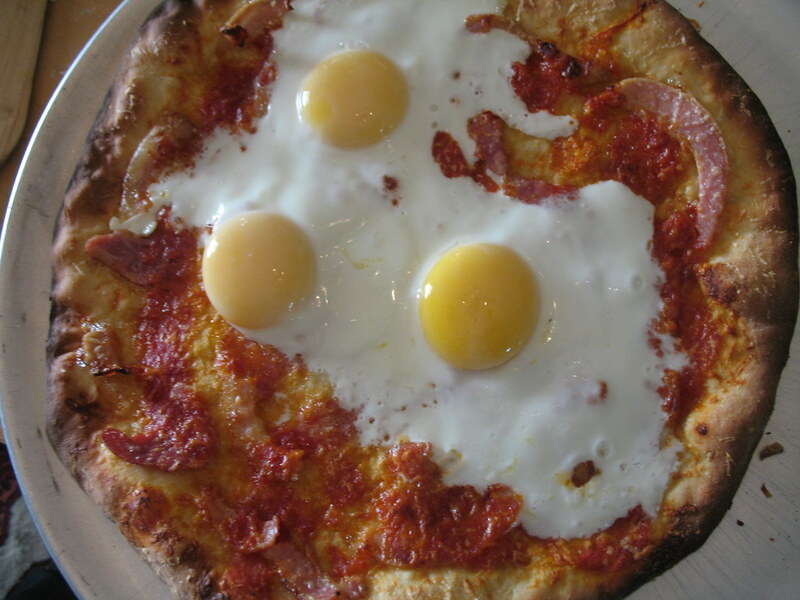 Not that I ever needed an excuse to eat homemade pizza for breakfast, but that official breakfast version looks fabulous. I, too, agree – runny egg yolk is wonderful on all sorts of stuff, and I’ve been meaning to fry up some sage leaves for ages. Thanks for the delicious inspiration! I tried this once and I loved it. But I am not too good with fried eggs, so I had to modify and make it scrambled. The fried sage gave it an excellent twist. I LOVE everything on this pizza, especially the fried sage, yum yum YUM! This class sounds like so much fun. Thanks for sharing the wisdom! There’s nothing that a fried egg on top of doesn’t improve. Jan – You are not wrong! Picasso, in the village used to have, for me and others, the best pizza anywhere (including 22yrs living in italy for me)…it was one of those rare occasions when my friend and I, after finishing our respective pizzas, order the “dessert pizza”, that is, the first being so good, we split another one! thanks for your great recipes…tonight im making cauliflower mash and salad from ital parsley, pomegranate seeds, lemon/oil/s & p. and a potato fritatta..